Grand Central Publishing, 9781455530816, 448pp. At forty-eight, Marian Kahn, a professor of history at Columbia, has reached a comfortable perch. Married, wealthy, and the famed discoverer of the eighteenth-century adventuress, Lady Charlotte Wilcox, she ought to be content. Instead, she is horrified to find herself profoundly in love with twenty-six-year-old Oliver, the son of her eldest friend. When Marian's cousin, the snobbish Barton, announces his engagement to Sophie, a graduate student in Marian's department, Marian, Oliver, and Sophie find their lives woefully entangled, and their hearts turned in unfamiliar directions. All three of them will learn that love may seldom be straightforward, but it's always a gift. 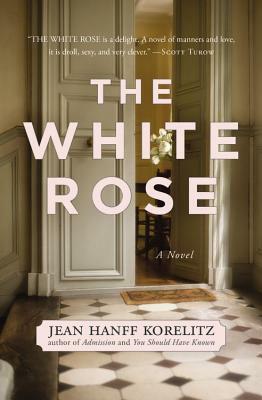 From the West Village to the Upper East Side, from the Hamptons to Millbrook, THE WHITE ROSE is at once a nuanced and affectionate reimagining of Strauss's beloved opera, Der Rosenkavalier, and a mesmerizing novel of our own time and place. Jean Hanff Korelitz was born and raised in New York and graduated from Dartmouth College and Clare College, Cambridge. She is the author of one book of poems, THE PROPERTIES OF BREATH, and three previous novels, A JURY OF HER PEERS, THE SABBATHDAY RIVER and THE WHITE ROSE, as well as a novel for children, INTERFERENCE POWDER. She has also published essays in the anthologies MODERN LOVE and BECAUSE I SAID SO, and in the magazines VOGUE, REAL SIMPLE, MORE, NEWSWEEK, ORGANIC STYLE, TRAVEL AND LEISURE (FAMILY) and others. She lives in New York City with her husband (Irish poet Paul Muldoon, poetry editor at The New Yorker and Princeton poetry professor) and two children.